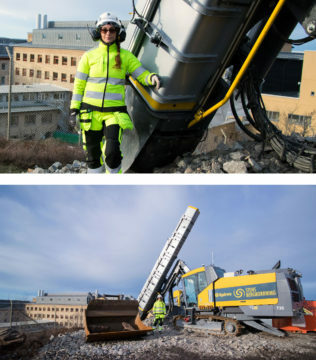 Mats Olsén is the experienced excavator working on the site now. He removes vegetation and soil to expose the rock. The remaining earth is then blown away with compressed air, and then Lobo examines the rock for cracks. Here Lobo and Olsén talk with an installer erecting a fence around the work site. NATURVETENSKAP LIFE. Engineering Geologist Romina Lobos is a sought-after supervisor known for her ability to carry out blasting with as little impact on the surroundings as possible. 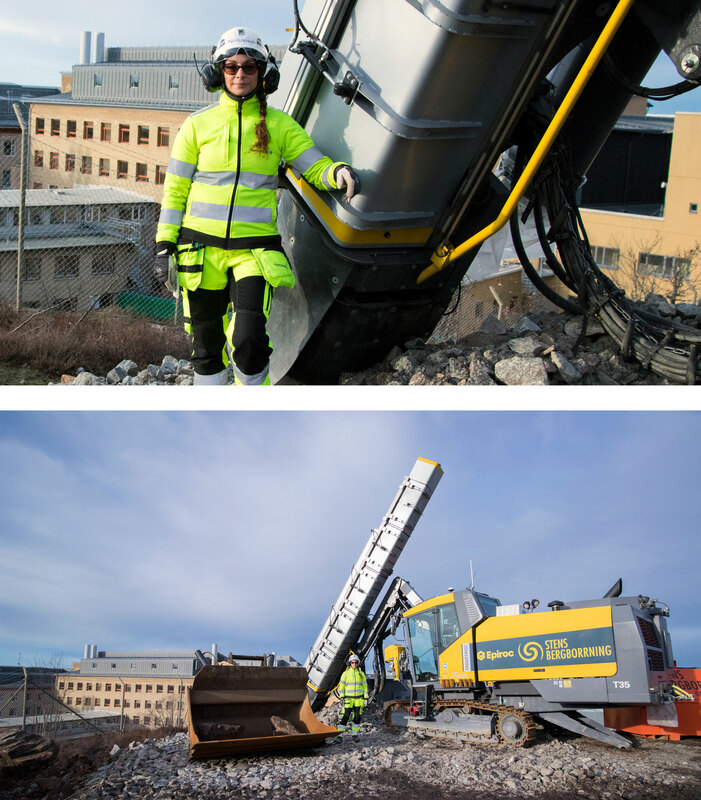 The team on her latest project, Naturvetenskap Life, includes a driller, a blaster and a excavator she specifically requested to work with her. “I work with the best guys, and I have a laser focus on the situation the whole time,” she comments. Blasting to prepare the site for construction of Naturvetenskap Life will begin soon. Since the project must be carried out with the utmost caution, excavation work will take time. Drilling and blasting will continue for 18 months, and Romina Lobos, the engineering geologist, is heading the work on site at Medicinareberget. 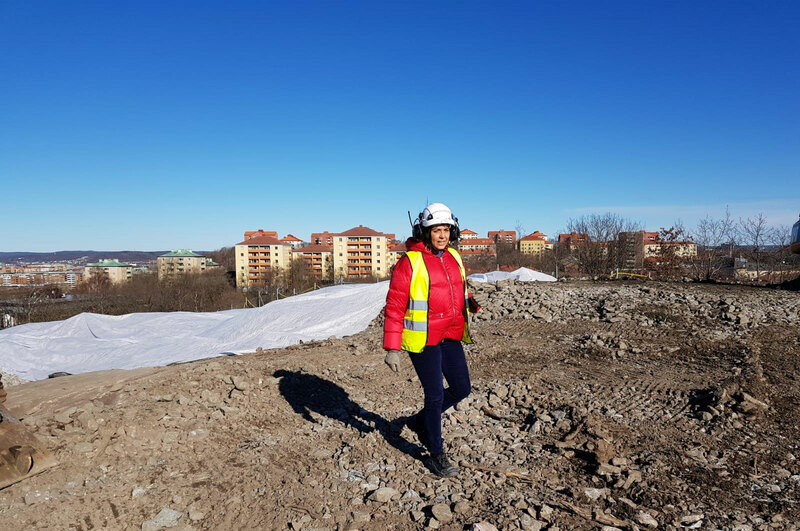 She works for the Norconsult consulting firm, which was hired by the contractor Skanska and Akademiska Hus. Romina Lobos in front of Felicia, her name for the brand-new drill carriage. It is equipped with a powerful central vacuum cleaner that collects all dust and also an effective muffler. The sound level right next to the machine during drilling is 84 decibels, which is significantly less than produced by many other drill carriages. In addition to planning and coordinating excavation at the site, Lobos assesses properties of the rock and works with the blaster to determine how deeply to place the dynamite in the rock. Lobos also takes a certain amount of delight in pressing the button to trigger the explosives. Akademiska Hus contacted Lobos a year ago to get her input on the project. 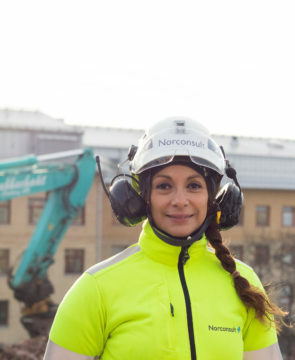 She looks forward to finally beginning work at Medicinareberget. “This will take up all my time for a year and a half. I love working with these guys who are part of the team here. We understand each other almost without words and depend on each other,” she says with her characteristic Spanish accent. The men she is talking about are driller Victor Åkesson, excavator Rickard Hessle and blaster Masen. Good rock engineering is a bit like baking a cake, she maintains. Anyone can follow directions, but the cake will not be nearly as good if the baker lacks flair. Well-implemented blasting minimizes disruption, and for Romina, working with the right people is crucial. Because Romina also has a blasting license, discussions often take place between her and Masen on which strategy is best in a given situation. They understand each other well and know what the other is thinking. The blasting will start at the beginning of February (week 7), initially as far away from Medicinarlängan as possible. More than 40 sensitive vibration meters have been deployed in premises next to the construction site, and Lobos is one of those who will receive a direct alarm if the meters are triggered. Blasting will occur twice a week at a time Lobos, her colleagues and the organization agree on. The agreed-upon times currently are Tuesday and Thursday between 12:00 and 13:00, with a contingency time of 15:00.